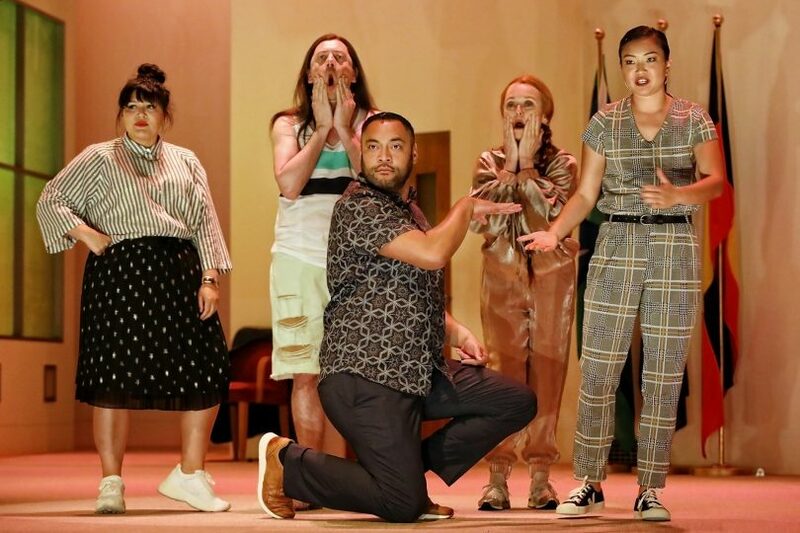 Nakkiah Lui with fellow How to Rule the World cast members Hamish Michael, Anthony Taufa, Vanessa Downing, and Michelle Lim Davidson. Photo: Prudence Upton. Part of playwright Nakkiah Lui’s motivation for writing How to Rule the World (Canberra Theatre from 3 April) stems from appearing on the ABC’s Q&A amidst a panel of argumentative politicians. On a much more down to earth level (literally) she came face to face with the effects of paralysing and destructive government policy when her elderly grandmother struggled to get repairs for a termite-riddled floor in her Housing Commission flat. It wasn’t repaired, and Lui’s grandmother fell through the floor and died a few months later. “That’s the effect politics can have on people’s lives,” she says. Lui is hot property: her work is being produced more than Shakespeare on Australian stages this year. When How to Rule the World comes to the Canberra Theatre, we’ll be seeing some sharp, modern political satire from the indigenous playwright. Basically, Lui says “an Aboriginal an Islander and an Asian walk into a bar, and leave with plans to rule the world. They’re educated and successful, they work in Canberra and in politics but they’ve reached a glass ceiling with their careers and they’re confused by the world around them politically and racially. Lui loves comedy (she stars, produces and directs in the ABC TV series Black Comedy) and she loves politics, but most of all she loves turning ideas on their heads and shaking them upside down. In How to Rule the World, she takes the old Australian idea of a fair go, and the more recent values of multiculturalism and asks how they work for everyone. Class also gets a nod: Lui says of herself that she is a middle-class Aboriginal person, but “my life doesn’t necessarily mean things have changed for everyone else. Some people have privileges of education, work, but many don’t, so why is that still the case? And it’s not as if these questions of privilege and access are too far away: her mother grew up by a river in regional NSW, being actively discouraged from completing school. Her grandmother lived in fear of losing her children to the Stolen Generations. Lui sees herself firmly in the bigger tradition of black theatre, which has been a powerful voice for change in the country. “Black theatre helped to define Australian theatre in terms of who we are and our community in relation to colonisation. Is the obstruction rule to blame for Raiders’ third loss on the trot?